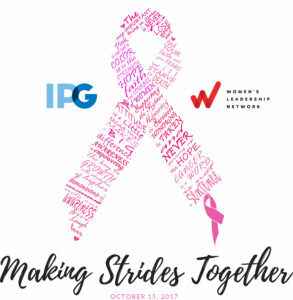 On Sunday, October 15th, the IPG Women’s Leadership Network NY Chapter participated in The American Cancer Society’s Making Strides Against Breast Cancer Walk in Central Park. The event raises money to fund innovative research, provide free information and support, and to help people reduce their breast cancer risk or find it early when it’s most treatable. WLN NY walked in solidarity with survivors, caregivers, men and women from all walks of life who are passionate about saving lives from breast cancer. Led by our Team Captain, Stephanie McKee, our team raised $3,801. The IPG WLN Team Page will remain active until the end of the year if anyone is still interested in donating to the cause.